A lot of people who get fed up with their defective cars call the car’s manufacturer, hoping to get help. Don’t bother. Let’s say you buy a brand new car and something goes wrong with it. You take it to the dealer, they work on it and give it back to you. It may or may not be fixed. Let’s just say the problem happens again and you bring it back in. Each time you drop it off, you are hopeful. But your hope diminishes with each visit. You are your wit’s end. What do you do next? Many people decide to go up the chain of command and complain to the manufacturer. Once Ford/GM/Chrysler/Hyundai/Rinspeed/Whoever gets wind of this, they’ll take care of it, right? 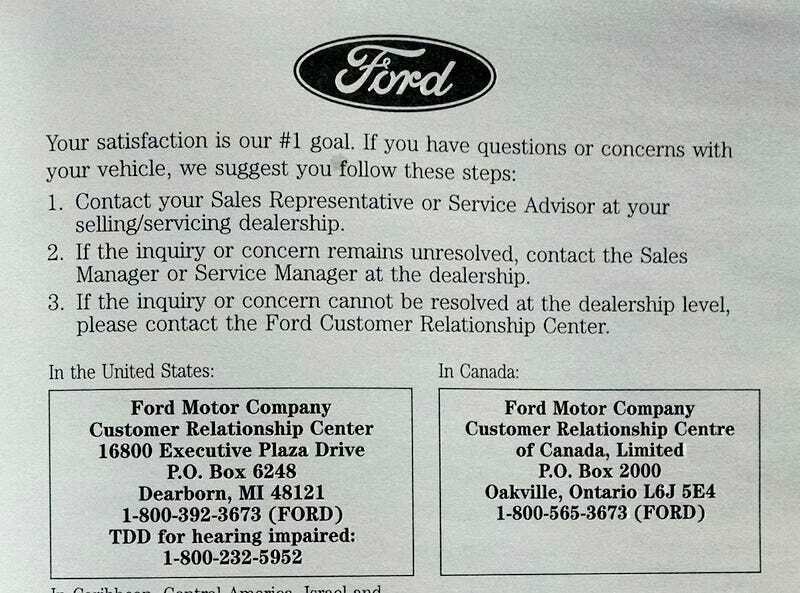 In the back of your owner’s manual is even a page which tells you to contact the manufacturer if you have lost faith in the dealer. The example up top is from the owner’s manual of a Ford Explorer. Notice a few things: It invites you to contact them. It does not say they will do anything for you. Because they won’t. This could all bite you in the rear end if your case somehow goes to court. How do I know this? Because I have sat next to a client being deposed (questioned under oath) by a manufacturer’s attorney who had a printout of all these kinds of comments. But the comments were never verbatim—as my clients often tried to explain—but had been summarized and spun to make the client look bad. Listen, don’t call the manufacturer to complain about the ineffective warranty work on your car. It won’t do you any good and it might come back to hurt you. It will waste your time. And yes, in most states you must contact the manufacturer if you intend to pursue the lemon law. But the last chance letter mandated by law has very specific guidelines. And none of your contacts with them over the phone count toward this.